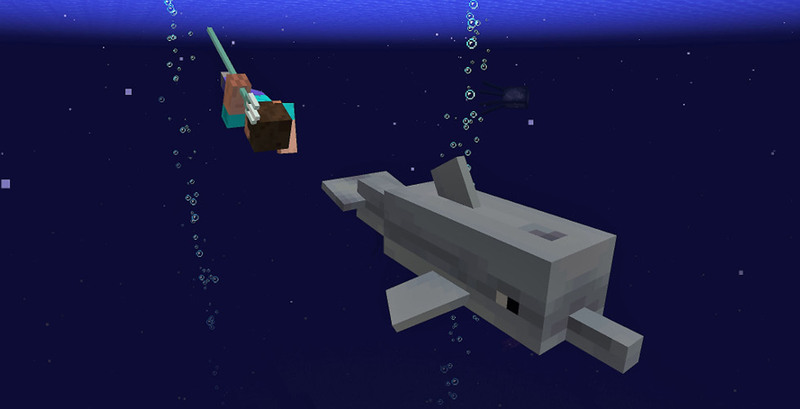 One of Minecraft's biggest updates ever will be arriving in the spring of 2018, which will host a complete overhaul of aquatic gameplay. Appropriately dubbed the "Update Aquatic," the ocean biome will now randomly generate objects like coral and fish differently, as well as accounting for additional ideas like underwater treasure hunts and shipwrecks (with helpful dolphins who will guide you toward them). Aquariums are also in, and another big change is the addition of the trident weapon (which can be used as a melee attack or thrown, or even enchanted to act like a boomerang). Mojang also used the opportunity during the unveiling to announce that the "Super Duper Graphics Update" and Switch cross-play have been delayed into 2018. The reason for delaying the latter is to make sure that the collaboration with Nintendo is "just right," which seems to line up with Nintendo's famous "ready when it's ready" mentality. As a reminder, Sony is the lone holdout in the cross-play program -- as it stands, PC, Xbox, mobile, and Switch players can operate in the same play space. The former three can play together right now.